Carmen has a long and varied history on stage and film, starring such unlikely personalities as Régina Badet (prima ballerina of the Opéra-Comique), Theda Bara, Geraldine Farrar, Pola Negri, Raquel Meller and Rita Hayworth. Last Saturday night, Anna Maria Martinez, in her second outing as Bizet’s femme fatale since Houston ’14, sang to a combined crowd of 10,000 at the Dorothy Chandler and, via live satellite beams, Santa Monica Pier and Exposition Park. I seriously hope this performance got preserved on film because it was truly a night to remember. 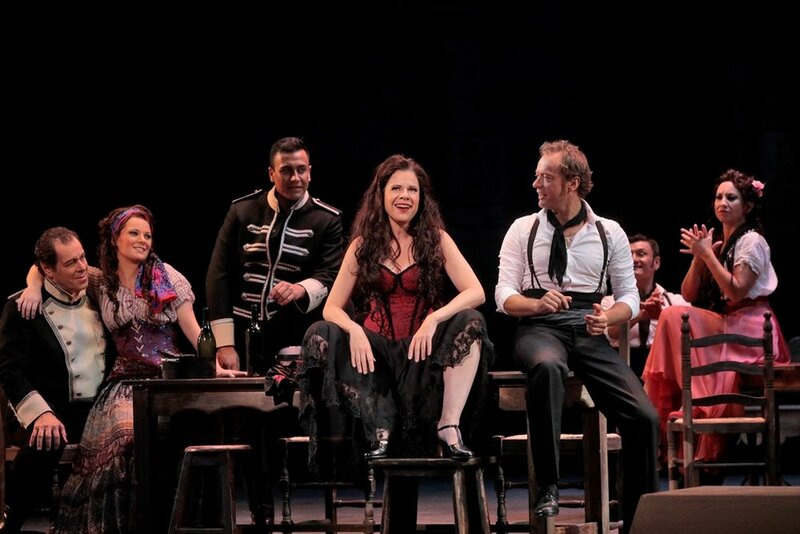 Unlike her predecessors portraying Carmen as an oversexed goddess, Anna Maria Martinez’s Carmen is more subtle and satirical, singing the ‘Habanera’ with smoldering allure and the ‘Sequidilla’ plainly in a mocking tone. In Act 2 chanson bohème and Act 3 card reading scene, there is no overtly sexual physicality in her acting, just an overabundance of vocal glamour and a hint of vulnerability betraying her devil-may-care persona. 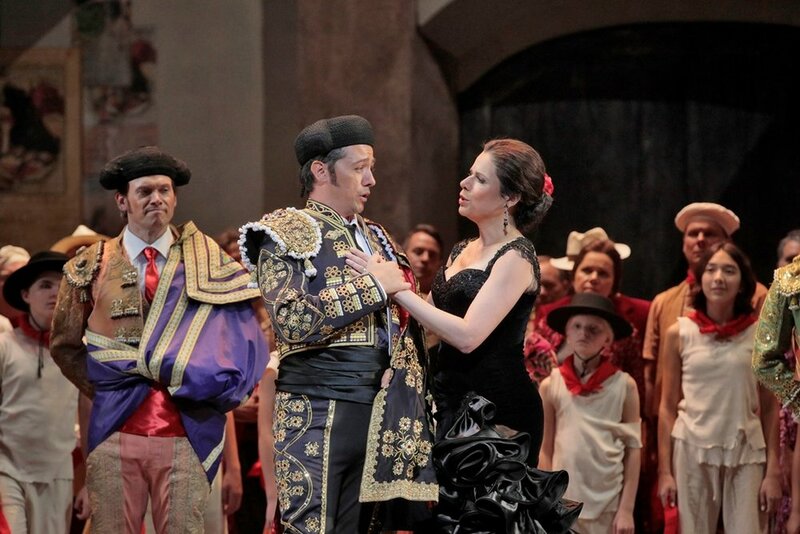 By the Act 4 finale, this Carmen has earned our empathy and her brutal stabbing sends shivers down our spines. Brandon Jovanovich’s Don José is rather stiff and dull to begin with, but as the performance progressed he gets much better, capping a ringing high B-flat on the Act 2 Flower Song and making the duets with Amanda Woodbury’s silver-toned Micaëla into something intimate and touching. Russian bass Alexander Vinogradov is a brilliant Escamillo, singing his Toreador song in vigorous and rolling black tones so excitingly rare these days. Soprano Liv Redpath and mezzo-soprano Kelley O'Connor are an unusually sympathetic Frasquita and Mercédès. Baritone Theo Hoffman and tenor Brian Michael Moore provided some comic relief as the happy-go-lucky smuggler duo Dancaïre and Rremendado. Rounding out this Carmen’s motley crew are the excellent Zuniga of bass Philip Cokorinos and Moralès of baritone Juan Carlos Heredia. The LA Opera Chorus manage to sound superb in their various guises as soldiers, cigarette factory girls and, last but not least, smugglers. The LA Children’s Chorus, to their credit, sing like sweet angels with nary a hint of Bizet’s rambunctious street urchins. 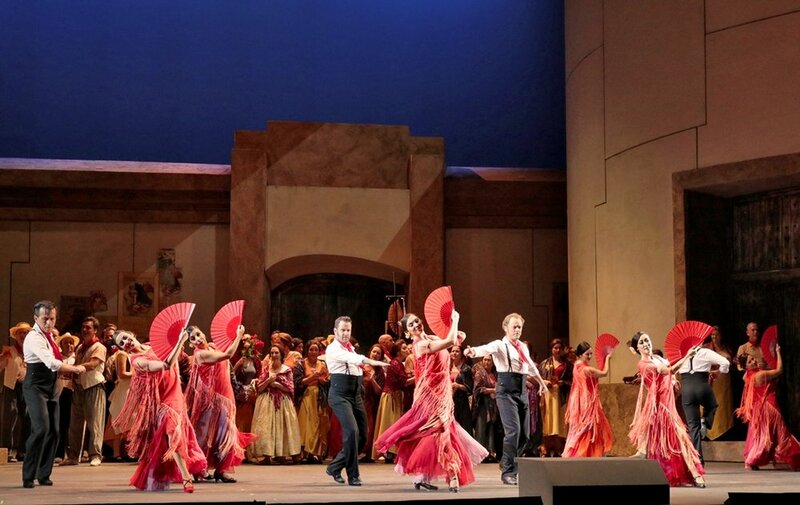 The traditional, Seville-inspired production went back a few seasons but still looks serviceable with Denitsa Bilznakova’s shiny new costumes, Ron Daniel’s direction and Spaniard Nuria Castejón’s choreography. The Entr’acte 3 and part of the Act 4 chorus are turned into a rousing flamenco dance number. Only two performances remain, on 9/28 and 10/1. The flamenco dancers alone are worth the price of admission.